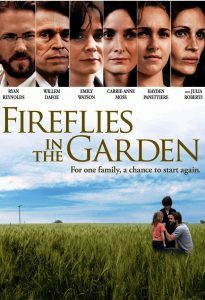 In this haunting family drama of recrimination and reconciliation, Lisa Waechter (Julia Roberts) is at the center of the story playing a beleaguered family matriarch who has subordinated her needs and desires to those of her family, particularly her cold, demanding husband (Willem Defoe). Lisa’s sudden death brings her entire clan together and triggers a series of flashbacks that reveal how the seeds of today’s discontent were planted years earlier. Juxtaposing past and present in a fluid, lyrical, and emotionally resonant manner, “Fireflies in the Garden” shows us that, while family is hard to live with, it is impossible to live without.